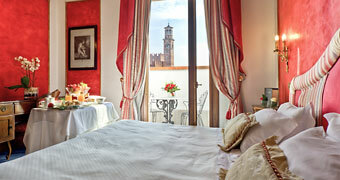 Immersed in an enchanting landscape, encircled by hills and crossed by the Adige River, Verona is of ancient origins. 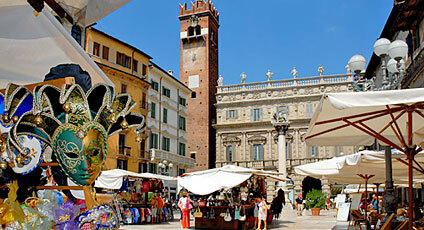 The town's political and commercial importance in both Roman and Medieval times, can be seen in the many important monuments, these include the Verona Arena, the Roman Theatre, the Gavi Arch, Porta Corsari, Porta Leoni, the Scaligeri archeological site, the Lamberti towers, and the surviving sections of the ancient city walls of Verona: the Mura di Galieno, and Mura Comunali, found between the Aleardi Bridge and Castelvecchio. 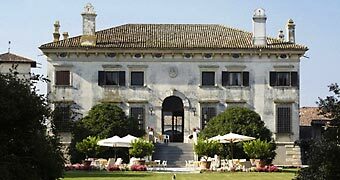 With its Arena Foundation, the Civic and Capitolare Library, the Literary Society, the Academy of Agriculture, Science and Literature, Verona University and Conservatory Verona is, internationally of cultural importance. Not to be missed: Juliet's House and her tomb, the Castelvecchio Museum, the Modern Art Gallery, Palazzo Forti, the Archeological Museum of the Roman Theatre, the International Center of Photography Scavi Scaligeri, and the G.B Cavalcaselle Museum of Frescoes.